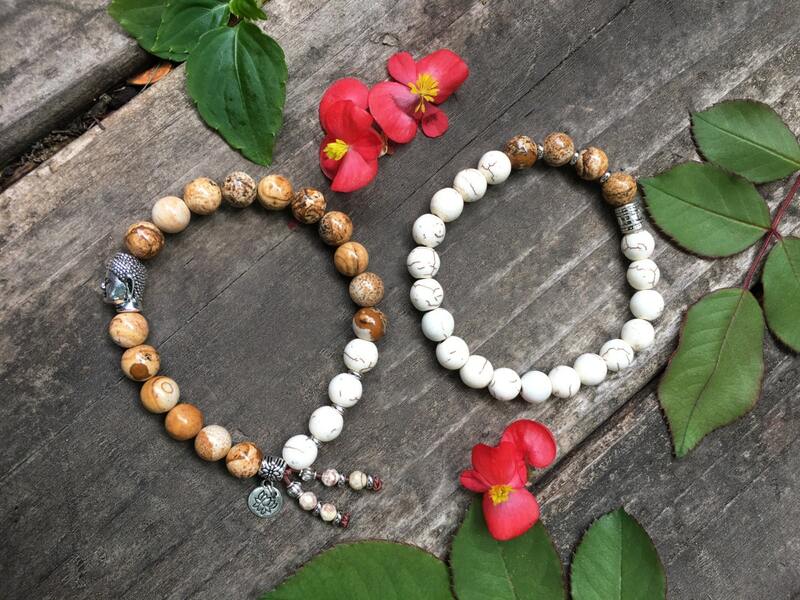 The Soothing Mala Bracelet set includes two mala bracelets made with high grade Picture Jasper gemstones along with sandy white Howlite gems, a Tibetan silver Buddha head and a miniature antique silver lotus charm to offer comfort and nurturing during times of stress. Buddha reminds us to treat ourselves and others with compassion, and that "happiness comes not from wanting something, but from no longer wanting anything." 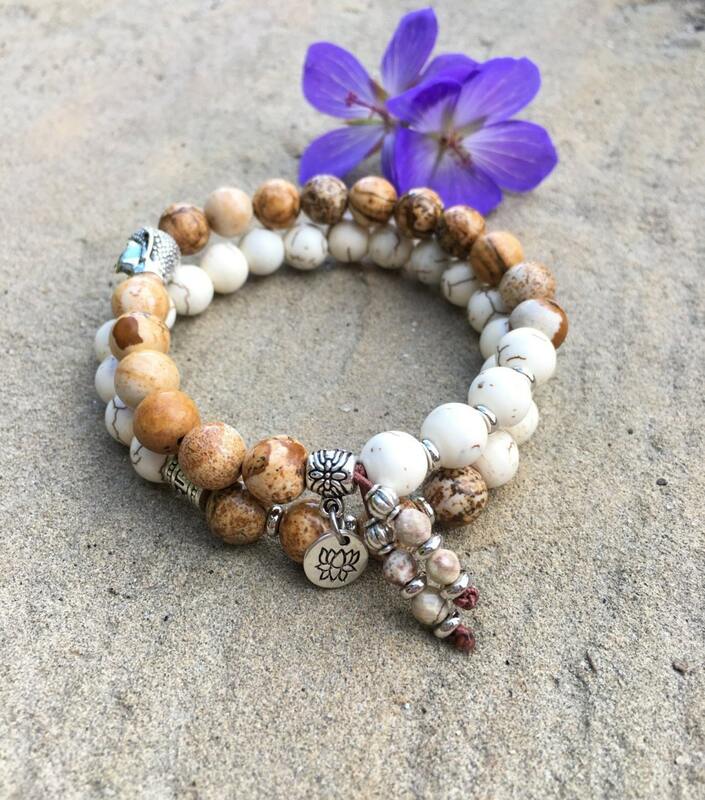 The lotus flower represents purity since it blossoms out of blurry, muddy water with ease. This is a simple reminder that we too can ‘rise out of the mud’ and thrive. It is also a symbol of detachment as drops of water slide easily off its petals. In Buddhist culture a fully bloomed lotus flower symbolizes enlightenment. The lotus has been a symbol of purity since before the time of the Buddha. Its roots are in muddy water, but the lotus flower rises above the mud to bloom, clean and fragrant. In Buddhist culture a fully bloomed lotus flower symbolizes enlightenment. 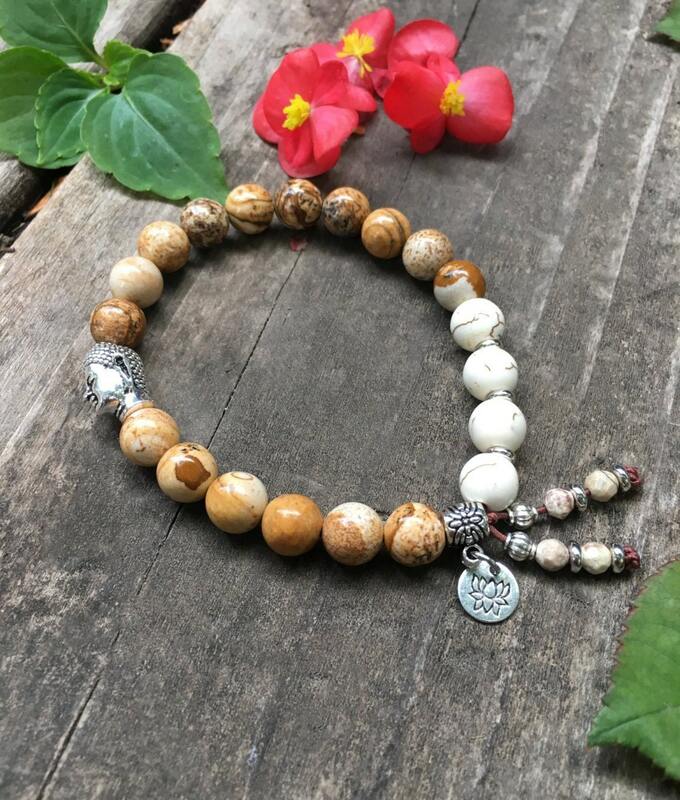 All Sacred Health Jewelry is blessed with sage and infused with Brenda's Reiki energy, adding another powerful layer of healing. 8mm and 3mm high quality gemstones, strung on strong elastic stretch cord. One size fits most wrists. Custom sizing is available.